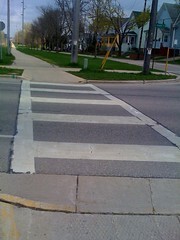 Why can’t you visualize a crosswalk, then step into traffic? You are here: Home / Uncategorized / Why can’t you visualize a crosswalk, then step into traffic? I know I’m in the middle of writing a series about compassion, but I got inspired to write this first, so I’m sharing it with you today. Or email me (links to my contact page). I’d love to hear the results that folks get trying this out… Feel free to share or ask questions below. Dmitri, your pieces work for me. Thanks. Dmitri, I like your including Fawn in your writing. I’m going to send this to my clients, former clients and parishioners. We are off to the MS Delta Friday for our 55th HS reunion. Have a great time! Looking forward to seeing you sometime soon. This is brilliant. It’s the first time I’ve seen the “magical thinking” concept appropriate isolated and removed from the idea of manifesting a positive outcome. Great examples – great article. Thanks Kimberly! I’m glad you liked it, I’ll try to keep ’em coming. I really got some important recollections from this – thanks, I’m certain they woke me up and back to my own base. Enrichening, truly! THANKS!